Standing on the grounds of Santa Maria de la Piscine with vineyards below and mountains in the distance. Before opening Lark, I wrote about food for big companies like Nestle and small ones like Gail Ambrosius Chocolatier. I also wrote restaurant reviews (it’s instructive to be on the other side of that equation). I got to know chefs, bartenders, distillers, winemakers, restaurateurs, and service professionals. When we decided to open a restaurant, they became generous mentors and supporters. They have become my friends as well as colleagues. I flat-out love most of the people I’ve met in this business and the foodies that support us. They are curious, generous, passionate and a lot of fun. And for those of us who geek out about food and drink, I don’t think there’s much more inspiring than travel. New tastes, new faces, fresh inspiration. Not surprisingly, when Richard and I travel it’s almost always centered around food, wine and spirits. We love sharing those experiences with others who will hopefully be inspired to go out on their own adventures. Which is my long-winded way of teeing up the remarkable trip that Richard and I took in September to celebrate our 10th anniversary. We left Lark in the very capable hands of our talented team and went to Spain and France for two weeks. 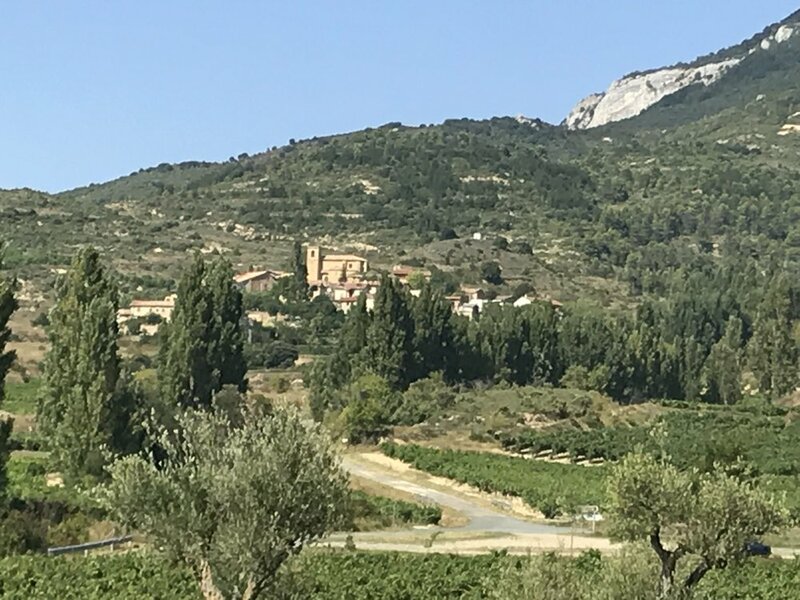 We flew into Madrid, picked up a car, and headed north to La Rioja, San Sebastian, and a few days in the Gers district of France before spending a couple days in Madrid. Each part of the trip was unique, so I’m going to write about each one separately. La Rioja was the first stop on our trip. We stayed in Haro, a lovely 12th-century town of around 11,000 people that is ringed with bodegas (wineries). The town square has a wall of wine barrels that celebrates all the bodegas in the region. La Rioja is basically Spain’s Napa, but it doesn’t draw the hordes of wine lovers you might expect. Haro’s main square is a love letter to wine. Haro is home to several celebrated bodegas, most within easy walking distance of each other and clustered around the train tracks. One of the most celebrated is R. Lopez de Heredia, which has its roots in the mid-19th century when French winemakers visited the Rioja region to find alternative sources of quality grapes, since the phylloxera epidemic had wiped out their vineyards. (Geek note: That same grape-destroying epidemic launched the absinthe craze in 19th century France as wine and brandy became rare (i.e., expensive) and absinthe was a cheap and plentiful alternative). Don Rafael López de Heredia y Landeta noted the French interest in the region and began building his beautiful bodega in the 1870s, incorporating their techniques into his winemaking. R. Lopez has won a lot of awards from sommeliers and its grounds were lovely. It was, however, one of the most disappointing tasting rooms we visited. They had only three wines available for tasting and they weren’t amazing. Their 19th century bar, sitting in the middle of what looked like a set from Woody Allen’s “Sleeper,” was pretty impressive, though. We walked across the street to Bodegas Muga, another beautiful winery with a polished tasting room and many options for tasting. Muga justifiably has a reputation as one of the best bodegas to visit while visiting La Rioja. Their website makes it easy to arrange tours and their staff is fluent in English. Hanging out at Bodega La Rioja Alta on a lazy Tuesday afternoon. 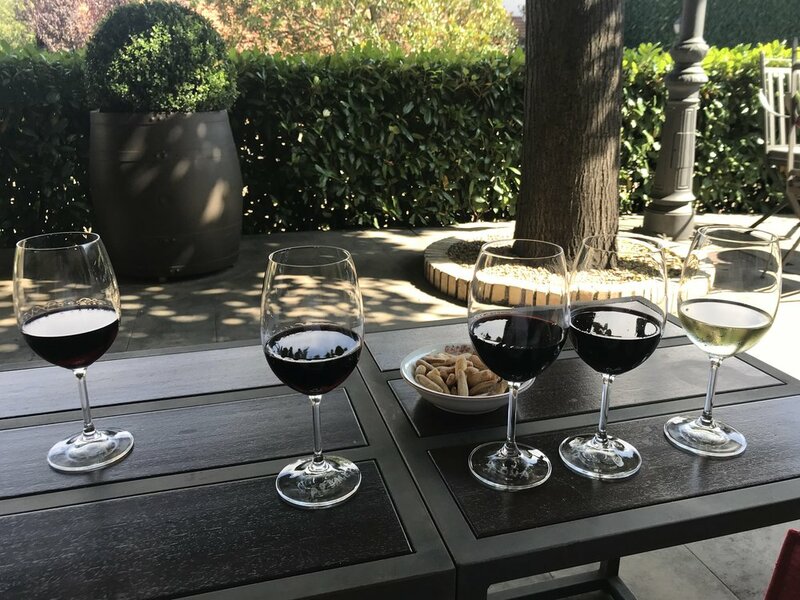 We spent a lazy hour sipping wines on the patio of Bodega La Rioja Alta, enjoying a brilliantly blue sky and admiring their neatly trimmed garden. It was my kind of meditation. Needless to say, by about four in the afternoon we were ready for a siesta. We had a rather unremarkable dinner and prepared ourselves for adventures further afield the next day. Our General Beverage rep, Matt Lyne, arranged a winery tour of Bodegas Montecillo for us the next morning. As we drove further out of Haro, we saw acres and acres of vines shrouded in fog and mist. The countryside, rocky and hilly, was unlike any landscape I’ve ever seen. On every other hillside, you could see the outlines of a medieval village with its church perched on the highest point. The fog burned off as the morning progressed, revealing the Cantabria Mountains, and we managed to get lost for about an hour before we found Montecillo. There was a ridiculously quaint, ochre-tinted village on the top of nearly every hillside among the olive and cypress tress and acres of vines. It’s on the outskirts of Fuenmayor, a town that didn’t look to have much to recommend it. But there were vineyards surrounding it in every direction and large bodegas that were less touristy than we experienced in Haro. We were disappointed as we drove up to Montecillo’s guarded gate. The winery was basically in the middle of an industrial park … so much for romance. But our opinion quickly changed after we met our host, Diego, and went on a tour of the mammoth facility. Standing in front of just a few of Montecillo’s barrels. The huge facility has only 25 employees. 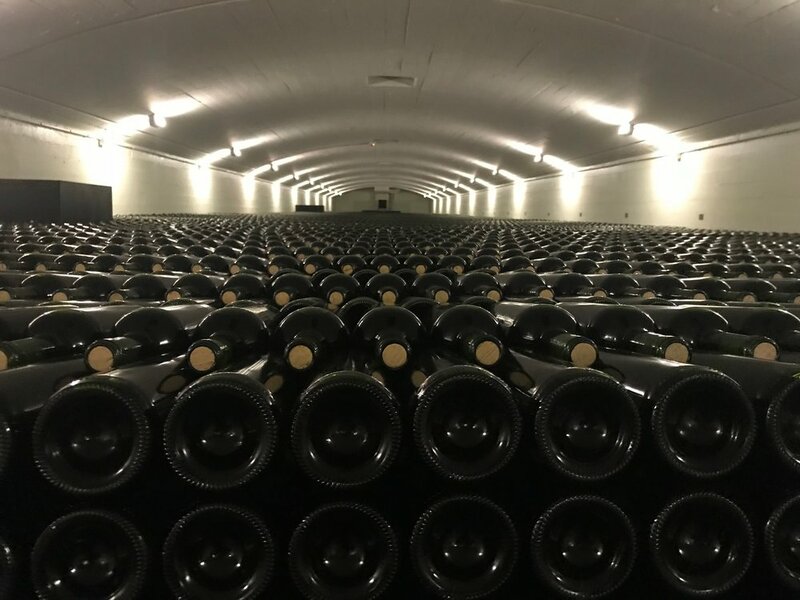 We got the multi-media video history and winemaking lesson, walked through a massive underground storage facility housing hundreds of barrels of wine, and then to the area where they hand-stack and store roughly 900,000 bottles for aging. Diego walked us through the area where they store vintages for decades. After the tour, we had a remarkable tasting and I had my first taste of lomo embuchado, thinly sliced, dry-cured pork tenderloin dusted with pimento. I thought Jamon Serrano was the bomb until I had this melt-in-your-mouth Spanish tease that I won’t be able to find here. That’s the downside of food travel. Diego seduced us with older and older wines that were increasingly rich with raisin flavors. The gran reserva from 1981 was one of the best glasses of red I’ve ever tasted. And, yes, we left with a bottle of it. And, no, we’re not sharing. This is what 600,000 bottles of wine stacked on top of each other looks like. All I can say is thank goodness we had a plate of charcuterie because it was just the start of a full day. We stopped at Bodegas Beronia, which was an especially impressive facility with hundreds of acres of carefully tended vines surrounding it. Their elegant tasting room overlooked the vineyard. We serve one of their gran reservas at Lark. Like many wines from Rioja, it’s a fantastic value for its age and quality. Diego provided us with maps and a tantalizing stop to visit … a 12th century church standing in the middle of a vineyard. 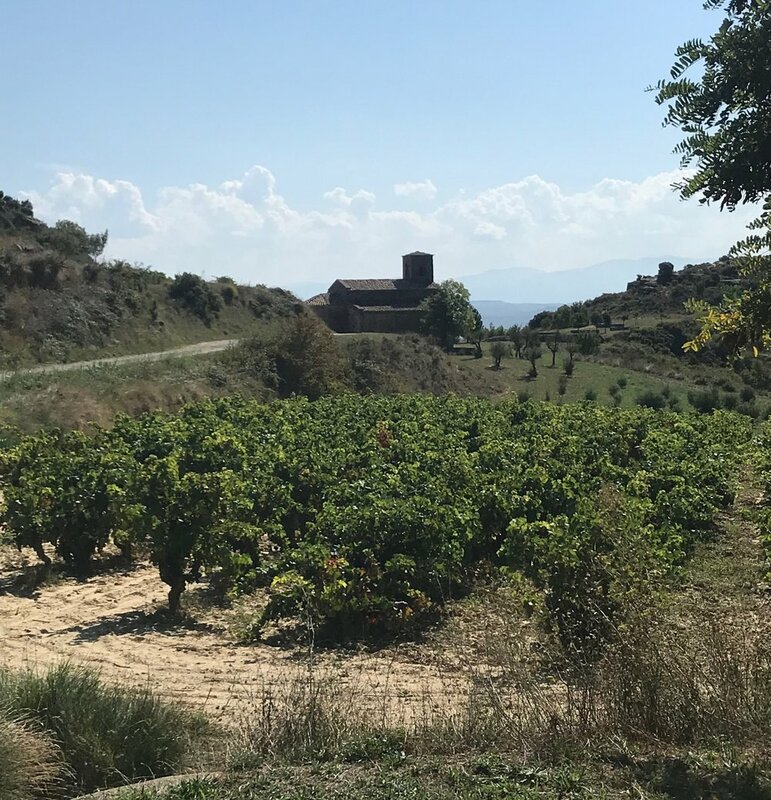 The vision of walking among the vines, popping ripe grapes into our mouths as we walked toward a beautiful ancient church was downright cinematic. Somehow, after a seat-clutching shortcut through a positively vertiginal hillside town, we happened to see the sign — Santa Maria de la Piscine. St. Mary of the Swimming Pool, as we jokingly translated it. Turns out, it was named for the Pool of Bethesda and built to house holy relics, including a supposed fragment of the True Cross. You couldn’t go inside, but walking around it was inspiring enough. Santa Maria de la Piscine sitting serenely among the vines. And the experience? It was downright cinematic. Workers were harvesting grapes in the distance. The valley spread out below us with vines as far as the eye could see. And the grapes were warm and juicy from the late-summer sunshine. Wow. A few days later, we saw a bottle of reserva with a drawing of the church on its label in a shop in San Sebastian. Another bottle to weigh down the spare suitcase we ended up buying in Madrid. A typical street in the ridiculously scenic heart of Laguardia. Needing lunch and some non-winery scenery, we stopped in Laguardia. Diego called it the “Disneyland” of Rioja and he wasn’t far off. But, hey, we were tourists and it was an absolutely gorgeous medieval walled village. As we were heading down the hill to the highway, I noticed a familiar, crazy-looking roof. 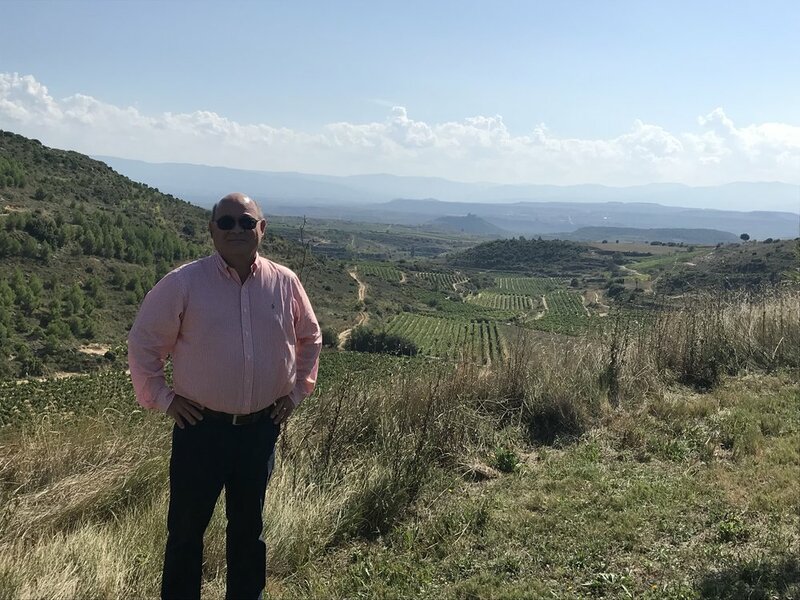 It was Bodegas Ysios, which is one of the Rioja wineries that travel writers swoon over. It was designed by Santiago Calatrava, the same architect who designed the Milwaukee Art Museum. Again, we were snaking around a rather uninspiring industrial park but then there it was in front of us. Words can’t do it justice, so we’ll settle for a picture. It wasn’t open to the visitors without an appointment but, honestly, just admiring the exterior was enough. Bodega Ysios was designed by famed Spanish architect Santiago Calvatrava. We passed many remarkable examples of modern architecture while driving around just a small portion of Rioja. There is a bodega designed by Frank Gehry that we didn’t get to see. There are literally dozens of wineries in the region to visit. We just scratched the surface. If you enjoy wine and impossibly gorgeous scenery, you will love La Rioja. It’s also a relatively inexpensive place to visit. A good pour of wine was typically around one Euro. Our lodging in Haro was around $100 a night — a one-bedroom apartment with a beautiful view in the old city center near lots of restaurants, shops and bars. We didn’t have any remarkable meals in Rioja, but the food was generally good and inexpensive. We truly loved our too-short time in La Rioja and will be enjoying their beautiful wines for several wedding anniversaries to come.